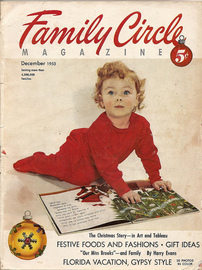 Family Circle is an American women's magazine published 15 times a year by Meredith Corporation. It began publication in 1932 as a magazine distributed at supermarkets such as Piggly Wiggly and Safeway. Cowles Magazines and Broadcasting bought the magazine in 1962. The New York Times Company bought the magazine for its woman's magazine division in 1971. The division was sold to Gruner + Jahr in 1994. When Gruner + Jahr decided to exit the US magazine market in 2005, the magazine was sold to the Meredith Corporation. The magazine is considered one of the "Seven Sisters", a group of seven women-oriented magazines, with the others being Ladies' Home Journal, McCall's, Good Housekeeping, Better Homes and Gardens, Woman's Day, and Redbook. Family Circle also sponsors the Family Circle Cup in the Family Circle Magazine Stadium in Charleston, South Carolina, a WTA tennis tournament which is the only Tier I clay court tournament in the United States. In November 2009, Family Circle launched their social network Momster.com for moms of tweens and teens.